Is It Worth? A College ERP Software? How effective is College ERP software? Most of us are aware of various companies offering ‘School ERP software’, by way of advertisements seen on newspapers as well as on the internet. Software companies find it easier to develop School ERP software because schools all over the world follow a single and/or limited number of boards of examination like CBSE, ICSE, State Boards, etc. and therefore with a quick snap of their fingers, they can customise the software accordingly. Schools are now benefiting a lot by using ‘School ERP software’, since most of the routine tasks get simplified and automated. 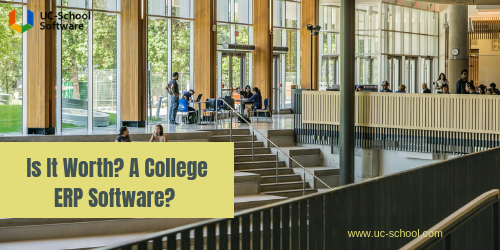 Why do very limited numbers of software companies provide College ERP software? Developing College ERP software is similar to that of School ERP software, but there are a few more complexities involved. Colleges are broadly classified into two categories – Autonomous and University affiliated. Autonomous colleges follow their own set of rules, regulations and syllabus for imparting education to the students and this makes them more flexible in running the institution. On the other hand, colleges with affiliations to universities need to strictly follow the rules, regulations and syllabus set up by the university itself, which restricts the ability of the institution to make changes as per the circumstances. Moreover, there are thousands of universities in the world, making it all the more difficult for software companies to customise the ERP software, as per the norms of the various universities. But there are certain companies who have the necessary resources and expertise in understanding and implementing these norms of universities for the purpose of development of College ERP software. Should colleges adopt ERP software? Will it be effective? The main question which now arises is whether implementing College ERP software will benefit the institution or not. But before we get to that part, it is important to first understand what activities colleges perform on a routine basis. Colleges offer various undergraduate and post-graduate courses. Each of these courses have their own set of affiliations, students, syllabus, faculty, examinations, fees, departments, rules and other activities, the management of which requires a lot of time, resources and paperwork. College ERP software specialises in managing and automating these activities in the most seamless manner, keeping in mind the university rules. Students who enrol for the various courses of the college can be easily categorised using College ERP software. This efficient categorisation of students is especially important for making the process of admission as well as fee collection easier since the students’ details as per their enrolment for the courses are entered into the software. This data of students can be accessed by the administrators anytime and anywhere. In most of the cases, undergraduate programs in a college are affiliated to a single university, but the postgraduate programs are most of the times affiliated to more than one university. In such a case, it becomes a very tedious activity for colleges to handle the unique set of norms for each of these universities. Using College ERP software, the institution can create a different set of portals for the efficient management of the affiliations for the courses offered. Colleges have a huge number of faculties for teaching because of the diversity of the courses provided. In order to ease the handling of the staff for different courses, colleges have departments catering to each of the subjects like the department of commerce, science, psychology, mathematics, etc. College ERP software has modules that specialise in making portals for these various departments which exist in colleges. This eliminates the possibility of chaos arising out of the management of an increased number of staff in departments. College ERP software provides ‘Bio-metric integration’, which helps the institution in establishing a unique identification for each student. Such identification of every student needs to be established so that no third party comes forward to get access to important documents of students like marks cards, degree certificates, transfer certificates, examination hall ticket, etc. Syllabus of each course offered by the college will be different from one another. In such a case, planning the syllabus for every one of these courses is very important. The best solution for planning syllabus is provided by College ERP software. It provides a module called ‘Syllabus planning’, that enables the college to properly plan the methodology for teaching the syllabus of the courses, as per the rules set by the university and/or institution. Colleges mainly conduct three different types of examinations which include preparatory tests, practical examination and semester examination. Preparatory examinations are conducted by the institution as per their own set of rules, whereas practical and semester examinations are held by the university and conducted as per the university’s rules. Well-organized management of the data of such different types of examinations can only be done by using College ERP software which helps in storing and accessing data from a single place. Colleges should surely think about the benefits of implementing College ERP software since by using it they can work in a paper free environment and can greatly reduce the burden of doing their routine activities in a traditional manner.